After installing Emailsaler, the first thing you need to do is to create an email account. The email account is what will appear in the From field of each email you send out. 1. Open Emailsaler and click on "My Accounts" button on the toolbar. 2. On the My Accounts dialog box, click "New" to create a new email account. 3. Enter your SMTP account information in the Account Settings dialog box. Contact your email administrator or provider or for help with any settings you’re unsure of. a. In the Your Name box, type your name the way that you want it to appear to other people. b. In the E-mail Address box, type the complete email address. For example, pat@contoso.com. domain name, for example, mail.contoso.com. b. In the Server Port box, type the port number of the SMTP server. For example, 25, 465 or 587.
the @ symbol, or it might be your complete e-mail address. b. In the Password box, type the password provided by your mail administrator, or one that you created. a. 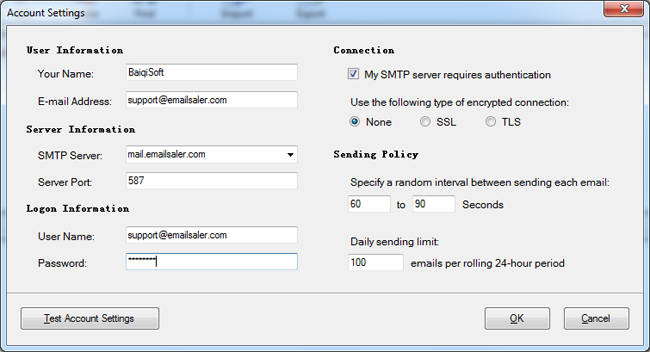 Select the My SMTP server requires authentication check box, if it is required by your account. instructs you to use one of these settings. sending each email, not a robot trying to spam others. period. Please make sure you do not exceed the send quota of your email account. a. The connectivity of the system to the Internet is confirmed. b. You are logged on to the SMTP server. c. A test message is sent. This message explains any changes that Emailsaler made to the initial setup. This option verifies that your account is working. If there is missing or incorrect information, such as your password, you are prompted to supply it or correct it. Copyright © 2015-2019 BaiqiSoft, All Rights Reserved.